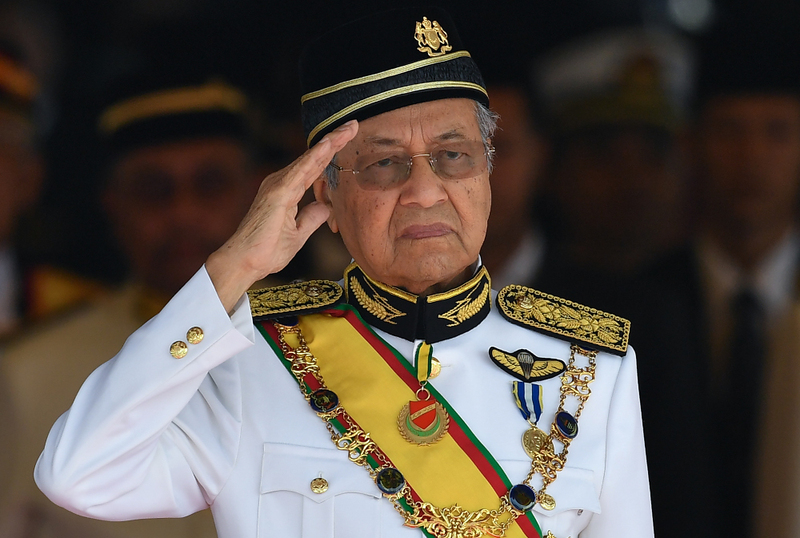 Malaysian Prime Minister Mahathir Mohamad salutes a royal guard of honor during the opening ceremony of parliament, in Kuala Lumpur, July 17, 2018. The Merdeka Center, a Malaysian polling firm, has issued its polls of the Pakatan Harapan (PH) government’s first 100 days in power. Overall the government of 93-year old Mahathir Mohamad is polling well, in both rural and urban areas, and across all races. Sixty-seven percent of the electorate has a positive perception of the government. While the government is coming out of its honeymoon period, the Malaysian people still see the country as headed in the right direction despite a dip of 9 percent in Merdeka’s polls. The polls indicate that there is high confidence in the government’s ability to address economic challenges (60 percent) and manage the economy (59 percent). These are critically important numbers as the economy remains the top concern of the electorate. While Prime Minister Mahathir remains popular, his personal poll numbers have fallen from 83 to 71 percent. And it is not just the prime minister who is enjoying high levels of confidence: seven of eight key ministers had approval ratings of well over 50 percent. Eighty-two percent of the respondents were satisfied with the results of the 14th General Election, and 72 percent were satisfied with the new administration’s attempts to reform the government. Sixty-five percent were satisfied with its efforts to tackle corruption. For the first opposition government to come to power in 61 years, these are very positive numbers. They indicate that the federal bureaucracy has quickly transitioned to serving their new political masters, and are no longer beholden and/or cowed by the Barisan Nasional’s patronage network. But the polling does raise some concerns that should be monitored, in particular regarding the sensitive issues of race and religion. While 62 percent of non-Malays were satisfied with the PH government’s “protection of the interest of their race,” only 50 percent of Malays were satisfied and 44 percent of Malays were dissatisfied. Overall support for Mahathir remains high, but among ethnic Malays, who may disapprove of his multi-ethnic cabinet and his calls to end preferential treatment and subsidies for the Malay community, it is only 61 percent. Indians and Chinese support him 93 and 83 percent, respectively. More telling is the support for Tommy Thomas, the country’s first non-Muslim attorney general. His selection was controversial from the start, with the king seemingly unwilling to endorse the appointment of a non-Muslim to the position. While 67 percent of non-Malays approve of Thomas, for Malays, the number plummets to 37 percent; while 38 percent disapprove of him. Although the PH coalition (including Warisan) won the election, they did so with a thin margin: 121 of 222 parliamentary seats, or 54.5 percent. The former ruling coalition, Barisan Nasional, holds 79 seats, or 35.6 percent of parliamentary seats; UMNO’s share of which is 24.3 percent. The Islamist PAS party holds 8 percent. UMNO clearly lost votes to Mahathir’s new party as well as Anwar Ibrahim’s People’s Justice Party. But it also lost supporters to PAS, which increased its share from 13 to 18 seats, better than predicted. What we have seen in UMNO since their electoral rout, in terms of their new leadership, is that rather than embrace a more multi-cultural approach as proposed by former UMNO Youth Chief Khairy Jamaluddin, the party is doubling down in the divisive identity-based politics of Najib Razak. And there is obviously concern amongst many Malays that the Chinese-dominated Democratic Action Party, the second largest component in the PH coalition, increased its seats from 38 to 42, or 19 percent of parliament. In short, never have non-Malays had such clout in government. The bottom line is that the Malay community is concerned that the government will start to roll back the reverse-affirmative action programs that protect the interests of the country’s ethnic majority. Malay opponents of the government will try to tap into the feeling that Islam is under attack. UMNO and PAS, which together hold 32.4 percent of seats, will likely find common cause in protecting the rights and privileges of the Malays, and assail any attempts to role those back, or weaken the growing trend of Islamization of Malaysian society. This puts the government in a bind. For example, in the recent uproar about a cleric marrying an 11-year-old girl from southern Thailand, cabinet minister Dr. Wan Azizah disappointed many by not swiftly or resoundingly condemning the practice of child marriage. Conservative Malays have found other wedge issues, such as LGBTQ rights, which they are trying to force the government into defending. Prime Minister Mahathir has been very clear that the government is in a precarious financial position due to the enormity of debts run up through corruption by the Najib administration. This was exemplified in the $4.5 billion 1MDB scandal. That will necessitate cutbacks in government spending and an end to subsidies, many of which benefit the Malay community. Right now the opposition can’t effectively challenge the government on its handling of the economy or the investigations into 1MDB. It has one course of action to win back the Malay voters that defected to the opposition in the May 9 general election: using wedge social issues, deepening racial divisions, and spreading fear amongst Malays that their interests are not being protected.